Battlestar Galactica was a wonderful TV show that was later transformed into a movie. The TV Show/Movie was about an extinction event that annihilated earth and the only survivors have escaped on board a space ship called Battlestar Galactica. The show was very popular and original that Microgaming has decided to pursue a license from universal studios to create a video slot that is themed around it, this way, online players will get to enjoy entering the world of their favorite TV show. 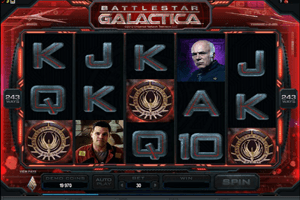 Play Battlestar Galactica Slot here. The entire interface of the game is inspired by the movie/show, this is why players will notice the futuristic look of the reels and the buttons. They will also notice that the symbols that land on the 243 ways to win of the game and the 5 reels represent many characters from the movie. Players will earn generous payouts by forming winning combos on the ways to win that they have activated. On top of that, the game has special icons and bonus rounds. For example, there is the logo of Battlestar Galactica, which acts as a stacked wild icon that can replace any other symbols on the reels of the game to help players get paid. The other special symbol is the Space Fighter symbol. When 3, 4 or 5 of these symbols land on the reels, players will get to earn fifteen spins for free, all payouts earned during the spins are multiplied by a 3x multiplier.